The "Corner Garden b&b" is the ideal stopover for cyclists, for those of passage and for those wishing to have a reference point to shoot the Marche cycling. The location is strategic and the absolute relax that this structure allows fortifies travelers. The "Corner Garden b&b" is also equipped with a closed garage for bicycles and a laboratory for making minor repairs on their own. Nearby a professional repairer agreement with the structure. 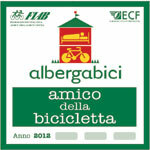 In the Marche region rail transport of bicycles is free! Basic tools for repairs and maintenance! Cycling information (maps, info on bike shops, etc)! Space to picnic and barbecue available for guests!